If you are experiencing continuous throbbing or severe pain from any tooth, that is a sign of an abscess. Wisdom teeth are particularly susceptible to abscesses because of their location. It is very difficult to keep the rearmost portion of the jaw clear of bacteria, especially when the wisdom teeth are partially erupted. Patients faced with an infection of one of their permanent teeth would require a root canal to save the tooth. 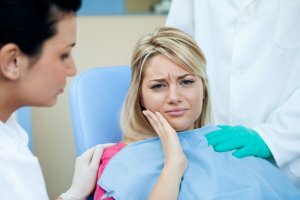 But since the wisdom tooth is considered nonessential, treating it with an antibiotic to heal the infection is an option. But once the infection has subsided, removing the wisdom tooth may be the best option for avoiding future problems. Because the wisdom teeth often do not erupt into full function, they may be partially present in the mouth. Depending on the angle and position, these teeth can impinge on the second molars (the teeth just in front of the wisdom teeth), causing an inability to remove plaque which leads to decay. The damage done to these molars that are needed must then be remedied with fillings or more expensive crowns. Is an infection that occurs in the gums surrounding the tooth, pericornitis is chronic in nature and best remedied by extracting the tooth affected so that the gum tissue can heal. Pericornitis is inflammation that literally takes place “around the crown”, the gums will appear red and puffy, and at times, pus will drain from the site. When the tooth is partially erupted, the bacteria that multiply under the gums and around the tooth cannot be removed by traditional brushing, and the area will be continually affected until the source of infection is removed. A fluid filled sac can form around the wisdom tooth, and often is only discovered by a dental x-ray. This is due to the fact that cysts usually are not symptomatic in nature. If left untreated a cyst can be responsible for the destruction of healthy bone, leading to a higher possibility of jaw fracture. To avoid the complications associated with third molars, we strongly encourage patients to schedule an oral examination to determine when wisdom teeth should be removed. To schedule an appointment, contact Prestige Oral Surgery at 732-297-7000.